That attitude – revealed in an inventive poutine, an Asian-esque cioppino – mostly works in its favor. “Did we pass it?” my dinner guest asks as we drive up Main Street in Lisbon Falls. The crispy chicken sandwich is topped with cheddar, sauerkraut, slivered onions, shredded lettuce and remoulade. 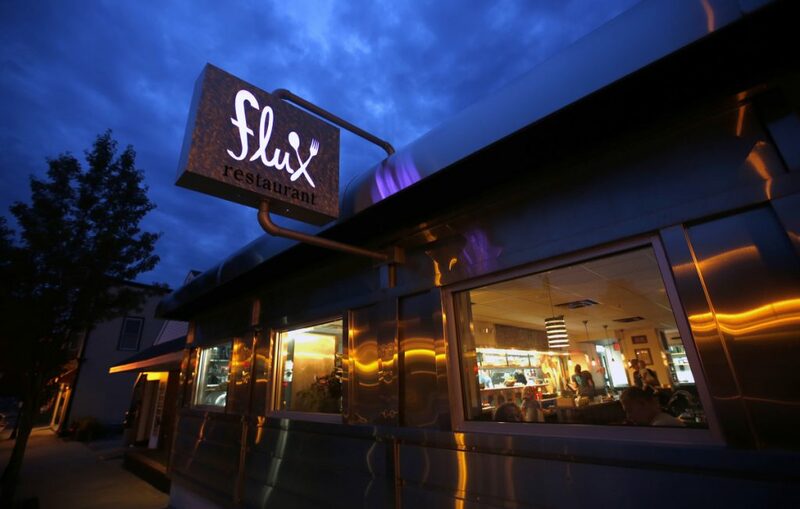 BOTTOM LINE: Open since early May, Flux in Lisbon Falls brings a creative perspective to modern American cooking. Chef/owner Jason LaVerdiere and his brother, GM/owner Tyson LaVerdiere, gutted a chrome-clad former ’50s-themed diner and remade the building into a casual, slightly upscale space that seats 80. They even built the gray-stained, lacquered tabletops by hand from raw pine slabs they found at wood lot a few miles away. Flux’s commitment to keeping everything anchored to Lisbon Falls is echoed in Jason LaVerdiere’s locally focused menu. Don’t miss his crispy, ultra-savory poutine made from cubes of compressed, layered potato slices; and be sure not to skip dessert if the Old Fashioned cake, a citrusy chiffon cake plated with bourbon-soaked cherries is on the menu. Just ask for the crème anglaise on the side. Do the same with the house-made sauerkraut layered into the umami-blasted chicken sandwich – it’ll save the sweet Hokkaido milk bun from getting soggy, and it might save the front of your shirt as well. “I see a red sign. No blue,” he says, as we leave the car and head down the hill. As we get closer, I see what he means. Except now, it’s cyan. No, wait…yellow. And then we both start to laugh. It’s a little on the nose, but it all makes sense: There’s a color-cycling LED in the sign itself, broadcasting a signal to passersby that – in case the name didn’t tip you off – this place is all about change. It’s not only produce that necessitates frequent last-minute changes to the menu. Proteins, especially seafood, are equally unpredictable. And not everyone is sympathetic to the trade-offs involved in small-scale, local sourcing. Next to me, a man at a neighboring table grumbles loudly, “You’re kidding. This happens all the time here!” when a server tells him that the fish stew ($21) will be prepared with scallops in place of locally caught halibut tonight. I’ve already ordered a bowl and decide to stay the course with my order when the same server stops by my table to deliver the bad news. 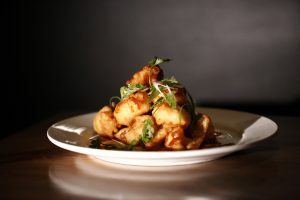 Tempura cauliflower is tossed in a Korean chili glaze and topped with cilantro and scallions. Scan the menu, and you’ll see precisely what he means. Next to tempura-style, slightly under-fried cauliflower served with a Korean-BBQ-inspired sauce of ginger, galangal and red gochujang hot sauce ($9) sits a riff on French-Canadian poutine ($10) made not with French fries, but with pommes pavés (in homage to French Laundry chef Thomas Keller): hard-seared, crispy cubes of compressed, layered potato slices that LaVerdiere blankets with a thick, house-made veal demiglace and gooey cheddar curds. Savory and unexpected, it’s one of the most original poutines I’ve tasted. Still, Flux can feel a little loose and experimental sometimes, even down to transcontinental cocktails like an elderflower, lime and Campari-based Tequila Mockingbird ($9) that is so sweet, it prevents the floral and bitter-orange elements from stitching together on the palate. Indeed, not all of Flux’s test balloons ascend into the heavens. Some, like the Far East salad ($6) are seismically off-kilter, with too much acid in the mint vinaigrette and a gloppy layer of rice vermicelli intended to call to mind Vietnamese bùn noodles. Others are just slightly out of alignment. Take the Old Fashioned cake ($7), a slice of orange chiffon served with seriously boozy bourbon-soaked Rainier cherries. Tender-crumbed and light, it’s already an excellent dessert that shouldn’t be drowned in a flavor-dampening crosshatching of crème anglaise that covers the entire slice. Server Marissa LaVerdiere carries plates through the dining room at Flux. Or the juicy, rice-koji-brined, deep-fried “crispy” chicken sandwich ($11) that goes damp before it even hits the table. That’s due in no small part to the overly generous portion of crunchy, homemade sauerkraut. I’d eat a bowl of the shredded red cabbage, fermented for ten full days, on its own; it’s that good. 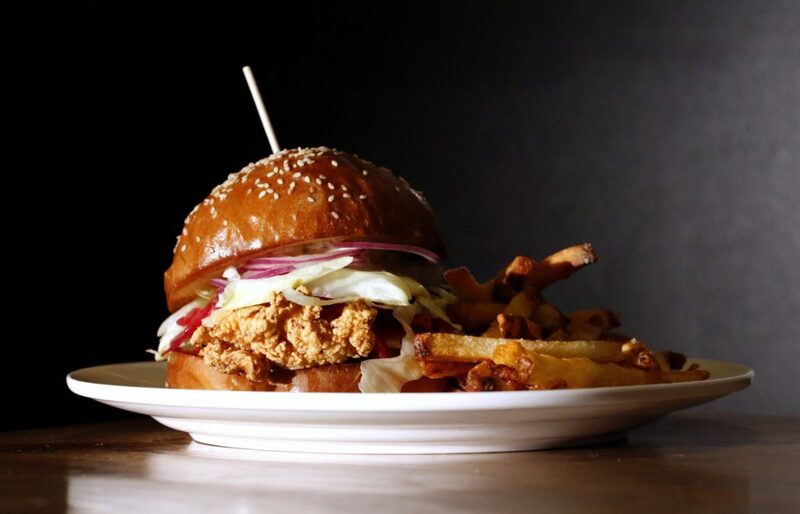 But it is also too sloppy for the sandwich, especially when LaVerdiere’s extraordinary sesame-sprinkled Hokkaido milk bun suffers as a consequence, dissolving into a mushy mess next to the double-fried, house-cut fries. Still, the cake and chicken sandwich are both nearly great – both just need a plating adjustment or two to get there. And if the server who told me, “We’ve been making a lot of little changes since we opened. 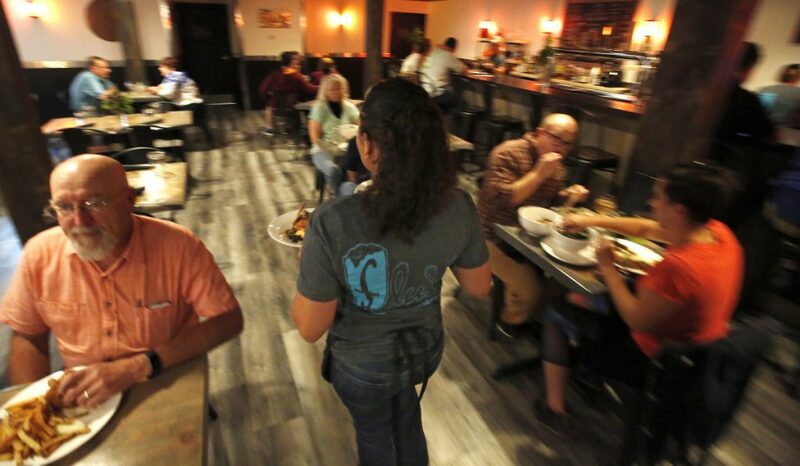 Customers, especially the locals, are really not shy when it comes to telling us what they think,” was being honest, I will not have been the first person to point these problems out to the kitchen. Perhaps more importantly, it probably won’t be long before Flux makes good on its name and embraces a bit of change, even if it’s just another tweak or two.